This picture reminded me of the apostle Paul's challenge to the believers in Rome. Let's not just blend in with everyone else but take a stand for Christ and His gospel. May the non-believing world see a remarkable difference in the lives of Christ-followers that would attract them to the Savior. Are you standing out from the crowd? Is there something about your lifestyle that causes the world to want what you've got? May it be so for His name's sake! CONFORMED or TRANSFORMED? That's the question! That's a beautiful photo! Where did you find those tulips?! I don't know about over there, but it's been snowing here in QC the past 2 days. Seriously, that is amazing that you put that scripture there. I just came across it this morning, and was going to use it in a letter I am writing. WOW! God sure speaks in many ways. I agree with Hebrews 11:1, David. We haven't got any here yet. I won't be seeing them this year in St Catharines, unfortunately. Maybe that Lauren-Mary will get some nice shots of them in Ottawa and post them. The Ottawa tulips are just out of this wotld Pigrim! This is such a good verse about our presenting our bodes a LIVING sacrifice! No use trying to do that after we're are gone, eh? We have to do what we can today!!! 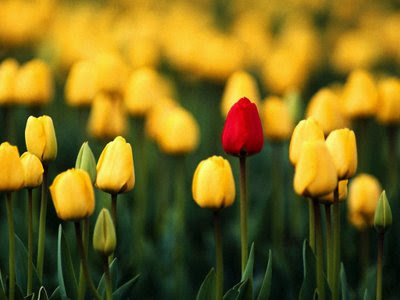 If we are not standing out from the crowd, how will anyone realize the 'Difference' that is with in us? The hopeless of this world need to see Hope. The dirty in this world need to see clean. Without sight of the transformed how will they ever know there is a different way to live? Great post.I enjoy your ministry here.